We noticed that many guys can’t add or insert MP4 to PowerPoint successfully. How to embed and play MP4 in PowerPoint 2016, 2013, 2011, 2010, 2007, 2003, 2000 without any trouble? Now read this article, you can find the best solution. Why Can’t Add MP4 to PPT? Every PowerPoint generation will come with its own advantages and disadvantages when working with MP4 video or other video formats. MP4 video is a container which can hold different video and audio codec, not all the MP4 videos can be supported by PPT, some PowerPoint version even can’t support MP4 video format. So the MP4 video codecs and audio codecs compatibility is the main reason why you can’t embed MP4 to PowerPoint successfully. On earth, how to know every PPT version and MP4 connection? Following will tell you the truth. PowerPoint 2016: The preferred video format is MP4. However, the video and audio codecs in the MP4 container should be H.264 video and AAC audio. PowerPoint 2013: Only supports .mp4 videos encoded with H.264 video (a.k.a. MPEG-4 AVC) and AAC audio. PowerPoint 2010: Only plays Apple QuickTime MP4 movie and must be with the Apple QuickTime player installed. In addition, PowerPoint 2010 64-bit version is not compatible with 32-bit versions of QuickTime; you must install a 64-bit version of QuickTime or Flash, or a 32-bit version of PowerPoint 2010. PowerPoint 2007 and lower version: Only support WMV, AVI, ASF, and MPG (MPEG-1) video formats, MP4 is not supported by PowerPoint 2007 and lower version. Especially some lower version can’t play video format. We know some video skills, the direct and common way is to change the video extension, sometimes this way really works, sometime, you may fail to insert MP4 to PPT too. But you can have a try, just 10 seconds, you can know the result, if not, you can try the solution 2. From above information, we can find another solution to help you to insert MP4 to PPT smoothly: in PowerPoint 2010, you can embed the Apple QuickTime MP4 movie to it. But you must know the PowerPoint 2010 version, PowerPoint 2010 64-bit version, you must install the 64-bit version of QuickTime. From above information, we all know the reason why you can’t import MP4 to PPT, the direct and wise way is to transfer MP4 to PPT acceptable video formats. Brorsoft Video Converter is the best option for you. This program can help you easily and quickly encode MP4 videos to PowerPoint friendly WMV, MPG while keeping the excellent output quality. Besides, it also features basic editing features such as trimming, merging, cropping, watermarking, and audio replacing facility. By using the trimming action you can clip a specific duration from a video clip and turn it into PowerPoint preferred format. If you insert MP4 video into PPT on Mac(macSierra), turn to Brorsoft Video Converter for Mac. Now, please download the most suitable program according to your need and follow the corresponding tutorial. 1. Click the “Add” button to load MP4 files from your computer or other devices like USB device, camcorder, MP4 player, etc. You can also directly drag the files you want to convert to the main interface. Batch conversion is supported so you can add as many files as you like at one time. 2. Click Format bar and choose your desired format. To embed MP4 to PowerPoint, you can choose WMV, MPG or AVI format from Common Video profile list. 3. (optional) Click the “Edit” button and edit your videos before processing format conversion. 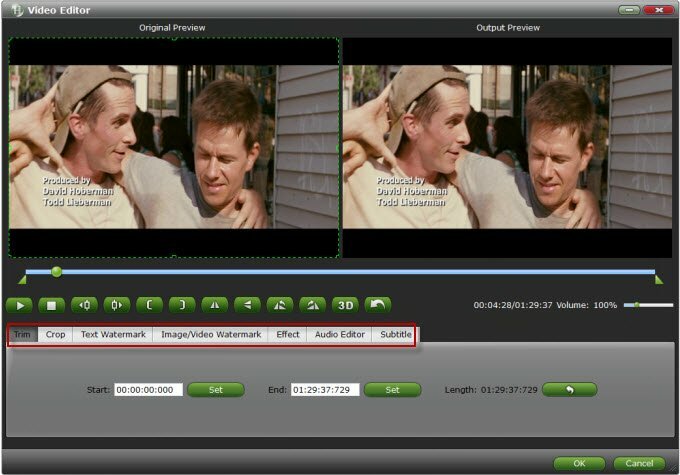 There are main seven functions available: Trim, Crop, Text Watermark, Image/Video Watermark, Effect, Audio Editor, and Subtitle. Open your PowerPoint presentation and click “Insert”. For PowerPoint 2013 and 2016, click the Video drop-down arrow, then select Video on My PC. Locate and select the desired video file, then click Insert. For PowerPoint 2007, choose Movie and select the video clips. For PowerPoint 2003, select “Movie and Sounds” > “Movie from File” to choose the video clips.